The problem is that it is not always easy to find the answers to such questions in reference books.…Enter Google. Obviously, there is just as much bad English on the web as there is in the real world. But there is still a chance that the correct form occurs much more frequently than the incorrect one. Tim Bray has a great post about his Mom’s transition from Windows 98 to a Mac mini. She likes the Dock, Dashboard, and iPhoto; she has trouble with CD burning, Safari’s Google search, and multiple copies of Microsoft Office. Matt Henderson’s backup strategy is similar to mine. He uses Synchronize Pro, DropDMG, File Buddy, and CDFinder. Frankly, I think it’s a disgrace that backing up today is lower-tech than it was ten years ago. I am, however, pleased with using DVD-Rs. Sure, I can’t fit all my files onto one like they once fit onto a single tape, but they’re cheap, fast, relatively durable, and the drives are everywhere. Rory Prior has mocked-up his own design for the Spotlight window. I like it. The first-run experience with a new Mac – or a new installation of Mac OS X – is much better now than it ever was before. The music is nice, the animation looks cool, and the new Migration Assistant makes it easy for anyone to move their important files from an old machine to a new one. I don’t write about the Finder much anymore because I feel like I’m wasting my breath. …widgets need to be created with the help of a graphic designer or Photoshop artist. An utterly unartistic programmer can design beautiful regular Mac software using the standard OS controls; a Dashboard widget that isn’t custom-designed by a good artist is going to stick out like a sore thumb. Scott Knaster reports that there’s now an applet version of the first video game. It runs the original source of the first version of Spacewar using a PDP-1 emulator. 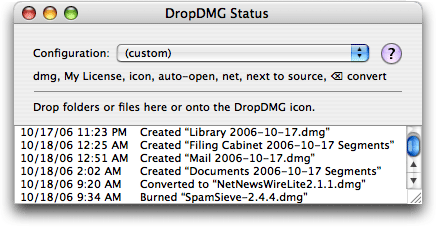 DropDMG 2.7 adds a bunch of features that (for me, at least) were long awaited. First up, we have disc burning. As I wrote a few months ago, I now backup my files with encrypted disk images, burned to DVD. I had been using Toast for the burning part. Toast is great, but it’s not optimal for this very simple task, where I usually want to burn just one file to each disc. With DropDMG, I can initiate a burn by Shift-dragging onto DropDMG’s window. Then I insert a disc and click Burn. It automatically chooses the name of the disc, and then I can follow the progress using a small, non-modal progress window. With multiple drives, I can burn more than one disc at a time. Of course, you might also want to burn folders or the contents of disk images, and DropDMG supports those operations, too. The idea is not to duplicate Toast or the Finder’s “burn folders” but to make simple burning operations really easy. If the files that you want to burn are already grouped into a folder or disk image, all it takes is a drag and drop. Next are improved progress windows. The progress bars when you create or convert images used to move one chunk for each step of the process. I was rather proud of the fact that DropDMG could figure out how many total steps there would be, since this depended on the input file as well as the precise combination of options chosen. But in truth, this type of progress reporting wasn’t very informative because some of the steps could take minutes (or hours, for very large images), while others took just a second or two. Thanks to Tiger and some changes in 2.7, it’s now possible for DropDMG to show smooth progress bars for the long steps. I also added cancel buttons to the progress windows. This had been on the to-do list since 1.0, but I kept postponing it because cancel buttons were tricky to implement and seldom used. By 2.7, however, DropDMG’s architecture had evolved to the point where it was possible to address each of the thorny issues with just a few well-placed lines of code. Hopefully, most people didn’t notice the lack of cancel buttons before—only a few wrote in to request them—but in the rare cases where you need them, they’re very handy, so I’m glad DropDMG has them now. Other improvements include a pop-up menu in the status window for changing configurations, improved scriptability, and a Quit When Done option. I’ve posted new Mac OS X builds of SQLite and CVSTrac. SQLite is built into Tiger, but this static library lets you build applications that work on Jaguar and Panther, too. I’m not using CVSTrac myself any longer, having switched to Subversion and Trac. This BBEdit update is a universal binary and adds a “Clear Spelling Errors” command (I’ve been wanting that for a while) and support for Objective-C++. I’ve found, when I try to use Cocoa bindings for my user interface, that it’s never quite flexible enough for what I need. Instead of trying to list the hurdles I’ve encountered in the abstract, I’m going to walk you through the first steps of a simplified example, called Categorizer, which is also available for download. This way, you can see the things I’ve figured out how to do, in addition to the dealbreakers. SpamSieve 2.3.2 includes accuracy improvements, a Quit when mail client quits option, improved Growl notifications, and various other improvements and bug fixes. Rory Prior critiques the Spotlight user interface (“Look at all those blue gradient bars. What do they remind you of?”) and the Mighty Mouse. He says the capacitive buttons make it difficult to right-click, and that the scroll ball feels like a TrackPoint and is worse than a standard scroll wheel. Seth Dillingham is looking for developers to donate licenses of their software so that he can auction them to raise money for cancer research and treatment. Apple selling a multi-button mouse isn’t quite as surprising as them selling a haxie would be. Still, I’m surprised that Apple went this route, rather than coming up with something more different. I’ve liked nearly all the mice Apple has made, and the Pro Mouse—I still use the original black-and-clear model—is the most comfortable mouse I’ve ever used. I love the idea of a multi-button mouse (as an option) in theory, but I’ve never found one that was comfortable. Having multiple buttons on the top increases tension in the hand, because I have to press one button while not pressing the other. Scroll wheels are cumbersome to use (though people only seem to admit that when they appear on MP3 players) and seem even more likely to cause repetitive strain. The Mighty Mouse’s side buttons look good. I’ve been using their inert predecessors to pick up my Pro Mouse for years. I withhold judgement on the top shell until I actually try it, but from Apple’s description it sounds like it will feel like a regular two-button mouse; the new technology just makes it look better. The scroll ball seems like an improvement in function (two dimensions instead of one) that doesn’t address the scroll wheel’s core problems: poor ergonomics and control. I think what I’d like better would be OS support for MaxiMice functionality. (A similar feature was built into the OS 9 Finder and Internet Explorer 5.) Rather than deal with a scroll ball, I could press the side button with my thumb to turn on “hand cursor mode.” Then I could scroll by moving the whole mouse, with the comfort and wonderful Apple acceleration curve that implies. How To: Is Your Memory Failing?